Appsfire and others have helped tackle the issue of mobile app discovery by bringing new social and sharing tools to bear on the task. Now, Zwapp, a new startup, is trying to go one step further by building essentially a social network around app discovery. The app, which is iOS (s AAPL) only right now, with plans for Android (s GOOG) soon, is similar in some ways to Appsfire. Both detect what apps you have and let you share your apps and see what friends are downloading. But Zwapp is attempting to be even more social by building in a news feed that lets you see app activity in real time and allows people to comment and respond to the updates. App pages not only allow you to share the app with friends on social networks but users can comment on the app and like it right on the page. User pages show what apps someone else has that you might be missing and who they’re following and who’s following them. Zwapp also provides tools for discovering new and popular apps downloaded by friends as well as a look at top iTunes rankings for paid and free apps. In some ways, it’s trying to be a social interface to Apple’s App Store, said Alexander van Elsas, founder and CEO of Zwapp. “When people put their iPhones on the table, they look at what apps they have. Zwapp allows you to do that easily and it makes the App Store a lot smaller,” he said. 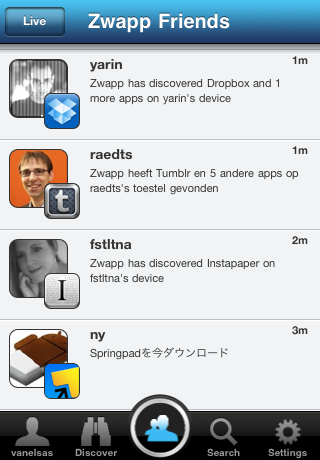 Like Appsfire, Zwapp starts by detecting the apps on a user’s device. Zwapp does this by checking the processes on the phone to see what apps are running. It also identifies custom URL schemes for apps to recognize them, something Zwapp needs to do because Apple sandboxes, or isolates apps. The custom URLs are like a shortcut that allows apps to open other apps. Zwapp said it can detect about 25-50 percent of a user’s apps right away with more added over time. Van Elsas is trying to improve that auto-detection with a new website called 1 Million App Schemes, which will ask users to run an open-source tool for Macs that will scan a user’s iTunes library to locate custom URL schemes. The anonymous data will help Zwapp better identify apps but it will also be made available to developers as an open resource for inter-app communications. Improving auto-detection of apps will certainly be helpful for Zwapp, which must get noticed in a field of app discovery tools. And it will face stiff competition from Appsfire, Chomp, Appolicious and others who have a lot of experience identifying and recommending good apps to users. And they have a number of features that cover some of the same ground as Zwapp. 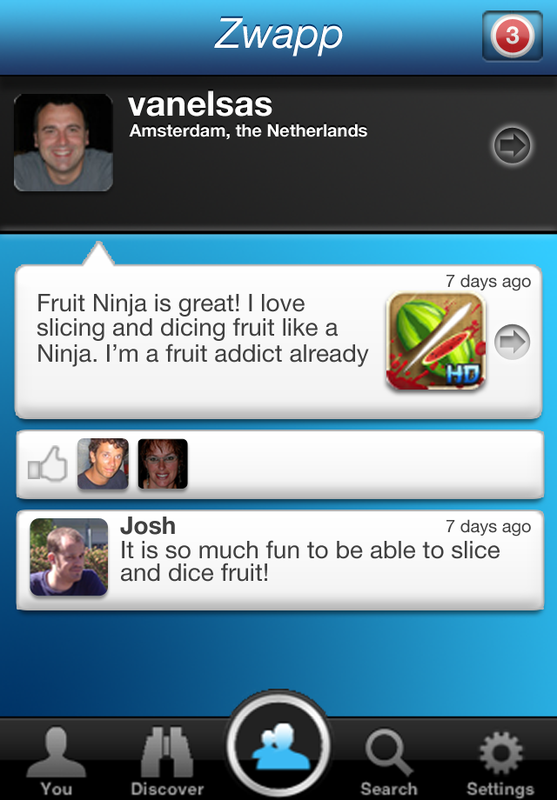 But overall, I think Zwapp brings some good ideas to the table. It’s built from the ground up to be social and real-time. And it has a clean interface that easy to navigate. I’m not sure everyone has the time to invest in a separate network like Zwapp, but with app discovery becoming more complicated with the flood of apps, it’s good to have another option available. Great idea and seemingly well developed, because a lot of app popularity is accredited to word of mouth. This is just another medium for an app to become viral, but one problem I can think of is just how interactive people will be with their apps. These programs are very come-and-go. People want to keep up on Twitter and Facebook because of the interesting content that will pop up. This app is kind of like people “Tweeting” solely about other apps, and I’m just not sure how interesting that will be for other people. Another thing is that people have a hard enough time writing app reviews as it is- I know that whenever a request to write reviews for even some of my favorite apps, I’m not afraid of pressing “skip”, or “later”. Hi Jaime, thanks for your comment. We’re doing our best to make the service as social and simple as possible. We are already working on extra’s that will provide more value tot he user. So far the user community seems to use Zwapp regularly and seems to be very eager to share their favorite apps with their friends. By making that as simple as possible we feel that it becomes easier to use the service. That is why we invest in things like automatic app detection. It talkes all burden away from you to build up an initial app profile and gets you set up really fast.